Twitter’s everywhere these days. It seems like anyone who’s anyone has a Twitter account and, boy, are they using it. You’ve got celebrities, newspeople, politicians, and even your average joe logging in on there. Twitter is also the ideal chill-spot for bloggers and webcomic creators. Anyone worth their salt has made sure that they can relay their latest feelings, ponderings, and opinions instantaneously. After sitting on the sidelines for quite a while, I decided to join the revolution and see what all the fuss was about. Last week, I signed up (it wasn’t as difficult or mind-blowing as I had feared). Then I went on a search to find all of my favorite people. I’m a newbie right now, but I’m slowly getting the hang of it. I like to let people know what I have upcoming for ADDANAC CITY, and whatever it is I happen to be doing at the given moment. Twitter’s a great place if you like to be nosy and get up-to-the-minute information on your friends and/or fave celebs. One thing I have noticed, though, is that Twitter can become very addictive. I find myself stopping what I’m doing just to find out what somebody else is doing. And nine times out of ten, something’s happening. It’s the Land of Instant Gratification; sorta like a ticker-tape of titillating trivia. I can see how people get swept into it, especially while they’re at work. The ADDANAC CITY comic below depicts such a situation. I hope you enjoy it. If you are a faithful Twitterer, you can follow the life and times of Hank Addanac and I by clicking here. If your days are as weird and/or interesting as Hank’s, I may end up returning the favor and following you. My comic strip character, Hank of ADDANAC CITY, encounters a lot of people throughout his young life. He has an extremely bad habit of pulling pranks on the telephone. It’s a good thing that it appears he has friends in high places, because he’s gonna need ’em. My fellow cartoonist, Bearman, inspired me to try my hand at creating an Obama cartoon. I don’t know if I did as well as he, but I tried. I don’t consider this to be a political cartoon even though it depicts a political figure. This strip is, by no means, sanctioned by President Obama nor the United States government. I just wanted to have fun, and attempt drawing something different. I thought it would be kinda neat if Hank and Obama had some sort of interaction. Plus, who knows? Obama may visit ADDANAC CITY one day for one of his famous town hall Main Street stopovers. ADDANAC CITY News~ Do You Like To Draw? See? Drawing pictures of Hank enables you to pull all the chicks. I’ve mentioned this before, but I thought it was time to blog about it again. My webcomic ADDANAC CITY has been increasing in popularity lately. A few loyal fans, not to mention pretty decent artists, have sent me their own renditions of Hank, AC’s flagship character. Response has been strong enough for me to establish a Fan Art Page on the website. So far, I have received drawings of various styles from people throughout the United States. Each picture looks different, but that’s what makes them unique. I love to see other artists’ interpretation of Hank Addanac. I want to see your drawings of the ADDNAC CITY characters. You will have a chance to get your artwork posted on a comic strip website. Files should be no larger than 600 kilobytes (the smaller, the better. I’m workin’ wit’ a 56k modem, people). Use FAN ART in the subject line. I will pick my favorite entries and post them in a special section on the ADDANAC CITY website. I will be adding more artwork as I receive and approve them, so be sure to keep checking the site to see if yours (or your friend’s) has been selected. Addanac City FAN ART is open to all ages. You aren’t being judged, so don’t worry about if you think you can’t draw as well as Joe Blow up the street. If I think it’s cool, it’s goin’ up on the site. If I pick your art, I’ll give you credit underneath your picture with your name (or first name and last initial if you crave anonymity), so be sure to tell me your name in your email entry. And the way you spell it is the way I’m gonna spell it, so be careful. Also, include your age so you can inspire your peers. And to all you folks out there who create webcomics, feel free to throw something my way, too. I’d love to see your rendition of Hank and the gang. If I pick yours, I’ll be sure to throw you a link to your website underneath it. So, let me know what that is in your entry, too. Well, I think that’s all. Oh, yeah! The place to be to read some of the funniest comic strips out there seven days a week is at Addanac City. If you have any questions, just hit me back here or at the email address supplied above. Thanks, and I look forward to seeing your creations! Boy, it seems like Hank is everywhere. The little seven-year-old terror is wreaking havoc all over the internet. I love drawing the tiny tyke, but this is one kid that I would never wanna meet nor could I tolerate babysitting him. Hank has done it all, from giving his teacher a live beehive to almost getting his father castrated for mistaken adultery. He’s also left his best friend hangin’ after breaking a neighbor’s window. Yeah, Hank’s a handful, and I’m so glad he’s just an imaginary character. As an adult, I’m thoroughly enjoying the advancements in technology that are taking place in the world nowadays. I’m just thrilling myself silly texting and sending photos and emailing and doing all sorts of wondrous things with my computer and cell phone. I couldn’t imagine what it would be like to be a kid and have access to all that. I’d probably find some way to cheat in class (not that I condone any such malfeasance). Boys today don’t even have to ransack their parents’ room to find Dad’s old stack of Playboys anymore. It’s all right at their fingertips (get yer minds outta the gutter). My kids trip out when I regale them with tales of days of yore about telephones that used to have cords on them and how you had to have your phone conversations wherever the phone was kept with whomever was in the room. And don’t let me get started with them on the blessing of owning an Atari 2600. I know they roll their eyes at me like I did my grandparents when told of the days of walking to school. Times have changed, but I’m doing my darnedest to keep up with those cats and their hep ways. Gah…I feel so old. Let me get back to watchin’ The Price is Right. ADDANAC CITY comics~ On The Move! ADDANAC CITY is continuing to do well. I started AC with 3 updates per week: Monday, Wednesday, and Friday. After a few weeks of meeting those deadlines, I upped the ante to five days a week. That didn’t seem so difficult. I love creating my comic strip and I hope that it shows in the final results. I’m updating the popular comic strip series seven days a week now. A lot of folks are eagerly awaiting to see when the ol’ boy will burn out from such an intense schedule, but I don’t think it’s gonna happen (I hope). I worked on countless ADDANAC CITY comic strips long before I ever designed the website. I didn’t want to be just another webcomic that fizzled out because the creator only had ten strip ideas and was overly-optimistic about the concepts pouring in. I wanted to make sure that when I opened “my doors” to the public, I’d be able to carry it through and give them something fresh that will last for a long time. The reason I’m updating seven days a week is because most syndicated cartoonists do so. They create six daily strips plus one full-color Sunday edition. ADDANAC CITY is full-color all seven days. It’s a little more work, but I think it makes the strip look nicer. A few of you will agree with me. Every webcomicker has desired to be syndicated at one point. We wanted to be the next “Peanuts”, “Calvin and Hobbes”, or “Bloom County”. We soon found out that it’s not that simple to break into an industry where there only two or three new hires out of over three thousand applicants per year. However, we can publish our comics on the ‘net. And we can do it unedited and uncensored. We’re tha boss and what we say goes. That’s not always a good thing, though. I imagine you’ve encountered many webcomics that should have taken somebody’s advice on content or even concept. Hopefully, those comics will find their audience no matter how niched. What I am doing with ADDANAC CITY is seeing if I’ve got the cojones to do like the syndicated cartoonists out there. I wanna see if I can run with the big dogs, so to speak. I may find out soon that seven days a week is too much. It does sorta limit one’s social life: “I can’t go to the movies tonight! I’ve gotta post the new strip!” For the time being, it works for me. I’m glad I enjoy what I’m doing, cuz I’m doin’ it all the time. I just like watching the little world of AC as it grows and improves over time. If I discover that I can’t swing seven days a week or that no one else cares for a daily dose of ADDANAC, then I’m man enough to admit it and drop down to a more reasonable schedule. We’ll just have to see what transpires. NEWS ITEM: I’ve just opened up the official ADDANAC CITY STORE. So far, I’ve got a few t-shirt designs on there. I’ll be expanding the products in the near future. If there’s some Addanac City graphic that you would like on a shirt, just let me know and I’ll see if I can’t get ‘er done for you. I get commisioned every now and then to work on other artistic pieces. A gentleman from the South Boston Museum of Fine Arts contacted me with a request that I contribute something for the annual Tobacco Festival. They wanted to get several artists in my community to paint/decorate these wooden serving trays. The only stipulation was that the trays had to be designed with something that would commemorate the town’s tobacco heritage. I put aside my ADDANAC CITY comic strip for a few hours and created this piece. I wanted to design something original that still existed within the confines of the theme. I knew that there were, at least, twenty other artists doing the same thing, so I knew that I had some pretty healthy competition. I opted to commemorate tobacco heritage by visually telling the story of how tobacco history is passed down from one generation to the next. I imagined an older gentleman (perhaps a grandfather) showing a tobacco leaf to his young granddaughter. I chose acrylics in which to paint my scene (no fuss, no muss). Below is an enlargement of the design. Yeah, yeah…I know…the girl looks like “Wendy”. I didn’t intend for her to resemble the fast-food icon, but maybe my subconscious was hungry or something. My serving tray was auctioned off at the Tobacco Ball that they held in September of ’08. It fetched a relatively hefty bid, as did the other artists’ contributions. I enjoyed working on it, and I’m glad I took pics before it got out of my hands. What do you think of it? Most of you on the web know me best as “that guy who draws the ADDANAC CITY comic strip series“. Although I totally love Hank and his pre-adolescent gang of dysfunctional misfits, I’m an artist at heart and there are other things that I do in the visual realm. A few years ago, I became involved with my local theater group, Halifax County Little Theatre. These nice people gave me an opportunity to act for the first time (I’ll have to blog about that on another occasion). I played Walter Lee Younger in Lorraine Hansberry’s “A Raisin In The Sun”. Anyway, being that I am a well-rounded artist, I enjoyed my time as a thespian (no, I don’t have a lisp). Also, being that I am a controlling megalomaniac, I had to design the playbill, too. I began a wonderful relationship with the directors and producers of these plays and they started requesting my artistic skills to promote their performances. 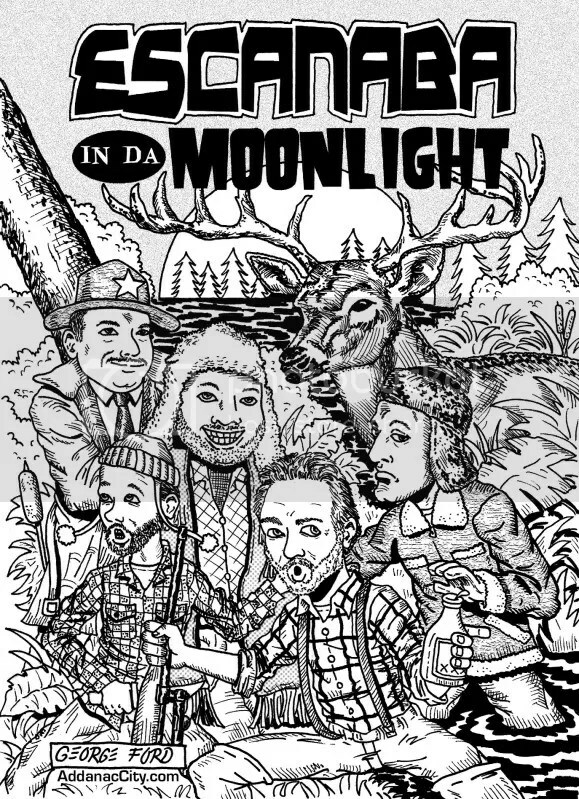 One recent project that I worked on was designing something eye-catching for “Escanaba In Da Moonlight”. This was a play originally written, produced, and directed by Jeff Daniels (yeah, that Jeff Daniels). “Escanaba” is a play about a man and his three sons who journey to their camp for the opening day of hunting season in the Upper Penninsula of Michigan. Strange things happen during their excursion. I came up with a pretty nifty design that they loved. This is it. I stopped by the rehearsals with my trusty digital camera and took photographs of all the actors in the production. I wanted to create something that was true to HCLT’s unique performances, so I made each character resemble the respective actor. I think I did a competent job. Most of the organization’s play posters are printed in black and white, so I had sorta limited creative freedom. It was different without having all of the magnificent, vibrant colors that I get to play with while creating my ADDANAC CITY comics. If you’re reading this blog, then chances are you’re one of the many thousands ones who read ADDANAC CITY faithfully every posted update. AC is in the running for votes on the Top Web Comics website. The site has a ranking system for just about every comic strip on the web today. I don’t expect to hit the number one spot, but I do yearn to get somewhere in the top (or lower) hundreds. So, if you could, dear reader, would you pleeeeez cast your vote for ADDANAC CITY? It only takes a second to vote. Plus, there’s no personal information for you to give nor is there anything to sign up for. All you have to do is type in 3 letters that denote the graphic you will see on the voting page. You may vote once every twenty-four hours if you wish, but all I’m askin’ for is just one lil’, ol’ vote from ya. Every vote counts. You can vote for ADDANAC CITY by clicking here. Now, on to some comics! I’m always reminiscing about something (it’s a habit us old folks have). As a kid, I was a big newspaper comic strip reader. I read nearly all of the classics: Peanuts, Beetle Bailey, Family Circus, For Better Or For Worse, Hagar the Horrible, Hi and Lois, Cathy, Dennis the Menace, and even Ziggy (ugh…no offense, Mr. Tom Wilson). I loved anything that would make me laugh. As I have stated in previous blog postings, I did not have access to newspapers often, so I had to make do with whatever comic pages I could procure. Most of the time, a relative saved the funny pages for me until I visited (it made going to see them a bit easier). Old folks smelled funny to me, but I could deal with ’em in exchange for a few minutes of uninterrupted comic euphoria. That’s why I loved the gag-a-day comic strips: I didn’t miss anything pertinent. If I didn’t see Tuesday’s paper, I could still get a joke when I resumed reading on Wednesday. Heck, weeks could go by, but when I returned, I could just plunge in where I left off and laugh myself silly at Charlie Brown trying to kick a football that Lucy held. Sure, a lot of these comics(the majority, in fact) were formulaic. You knew Charlie Brown was gonna get played by Lucy. You knew Sarge was gonna wax ol’ Beetle’s @$$. You knew Mr. Wilson was not gonna appreciate Dennis’s antics. For me, that was okay. These comics were familiar to me, they were dependable. I could count on them every edition. So when I hear someone say that ADDANAC CITY isn’t doing anything that hasn’t been done before, I don’t fret. Sure, there have been other “bad boys” in the comics before, but nobody has ever done it quite like Hank. I adored those type of comics. Give me something to laugh at and I will be back. That’s what I try to accomplish with ADDANAC CITY. The joke may seem familiar, but I always try to execute it with a fresh approach. Plus, someone else may not have heard the set-up or punchline before. Think of it this way: We’ve all heard the joke “why did the chicken cross the road”, right? It’s a moldy-oldie. But, remember, there are people (kids, even) who have never heard that joke. Somebody has to school them of the classics. Somebody has to tell it to them so they can groan 20 years later at the staleness of it. Nostalgia always returns. We’ve all seen Scooby Doo, but they’re makin’ babies every second who’ll see Scoob as something brand-new to them. One thing I didn’t like in the comic pages were the serials (or soap opera-style stories). I’m not saying anything was wrong with them, it’s just that I didn’t care about these characters or stories. Mary Worth could take a flying leap as far as I was concerned. Maybe if she had snappy patter or told a joke or two, I would have taken her more seriously (or sillier). I didn’t understand why the newspapers had such serious-type comics in their paper. I believe that, as a kid, I couldn’t truly appreciate what those cartoonists (storytellers?) were attempting to do. So, I figure Hank wouldn’t understand it either. I thought this would be a good strip illustrating my point. I would read Doonesbury when I was younger, too, and not comprehend one iota of it. Loved the art, but considered Garry Trudeau’s creation to be somewhat over my head. It was only until I got older that the series started making sense to me. Doonesbury is freakin’ hilarious now in reflection, but it didn’t do diddly for me as a kid. The following AC comic is a tribute to those who felt like I did. Enjoy.